This stainless steel non-stick stir fry pan is 26cm (10½ inches) in diameter and has a triple layer, non-stick Teflon® Pro Platinum interior coating. Unique glass straining lid for ease of use and safety. 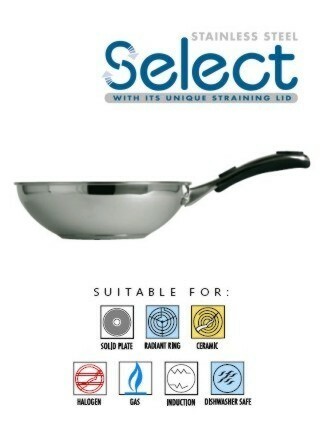 Twin pouring lips for left or right handed cooks on saucepans and milkpan. Skillets and stirfry have a triple layer, non-stick Teflon® Pro Platinum interior coating, for low fat healthy cooking & easy cleaning. Lids are a combination of stainless steel and heat toughened glass. Dishwasher and oven safe up to 180°C, 350°F or Gas Mark 4. Riveted stainless steel handles with ‘soft touch’ inserts, designed for style, comfort and safety. 4.5mm thick thermal base for superior heat distribution.